Is there anything quite like the feeling of dropping into turquoise blue water and drifting slowly to the bottom of the ocean as you not only observe the world beneath the surface, but become part of it? It’s hard to think of anything more perfect. Scuba diving is one of those magical things that is both peaceful and exhilarating. I spent a month in Belize earlier this year and was in the ocean almost every day. I was able to enjoy dozens of absolutely incredible dives and encounter more large marine life than I had seen in my diving adventures. Home base for the month was San Pedro, on the gorgeous Ambergris Caye. It is the ideal spot to access the underground playground that is the Belize Barrier Reef, the world’s second largest barrier reef system. There’s a lot to experience in Belize, and I could write for hours about the vibrant culture, delicious food, breathtaking sea views, and the wonderful inhabitants of San Pedro, but to keep things concise I’ll focus on the ocean! Here’s my round up of five can’t miss ocean experiences in Belize. Staying oceanfront in San Pedro, you can go from your hotel room to the dive boat in five minutes flat. The dive culture in Belize is amazing, the divemasters and all of the visitors are so passionate about the ocean. 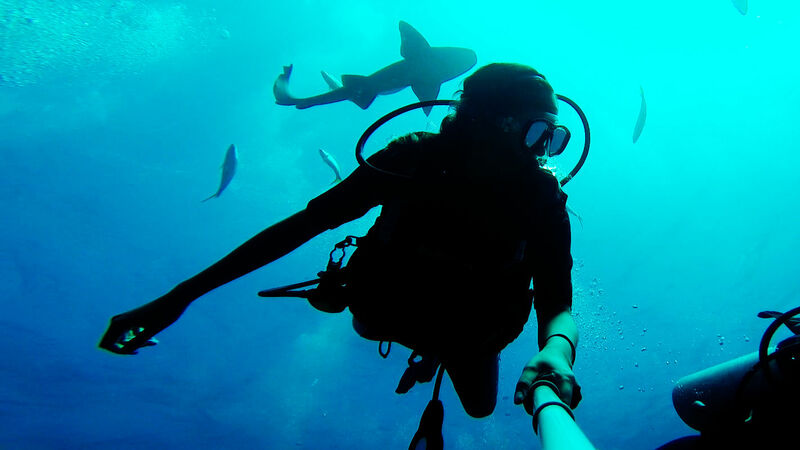 Whether you’re traveling solo, as a couple, or as a group, making dive buddies is a cinch. There is so much to see on local dives leaving from San Pedro. In most cases, you’ll be at the dive site within 10 minutes. Nurse sharks are regulars on almost every dive, and it’s always easy to find a turtle snacking away on the reef. If you’re lucky, it’s possible to see dolphins, reef sharks, hammerheads, and whale sharks at the right time of year. 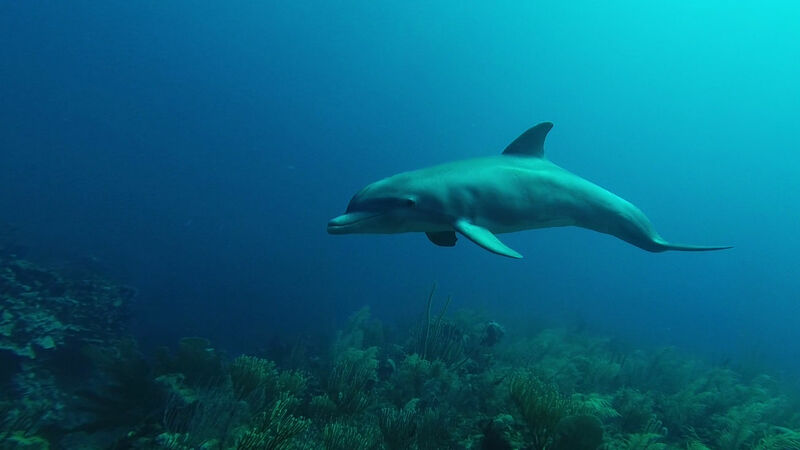 My best experience was back rolling off the dive boat and right on top of three dolphins! Myself and my fellow divers were treated to a beautiful display of playful frolicking by the group. How lucky! What an experience. This is the reason many divers go to Belize, and a day trip that can’t be missed. Expect to wake up at 5:30 am for your departure and not return home until sunset. This was without question one of the best dive days I’ve had in my life. Amigos Del Mar’s Blue Hole day trip includes three dives, lunch at Half Moon Caye, and a boat ride home full of (optional) rum punch fueled shenanigans. The Blue Hole itself was surreal, eerie, and out of this world. We dropped down to 135 feet and drifted through the caverns between stalactites and stalagmites – or in my case, barrel rolled through in a state of mild nitrogen narcosis. Several types of sharks can be seen in the deep blue, and in many cases they’ll pop up to get a look at their air breathing visitors. The next two dives were near the Caribbean jewel, Half Moon Caye- at the sites Aquarium and Eagle Ray. They were teaming with marine life. We encountered reef sharks, eagle rays, and more fish than I’ve ever seen on one site! On the sunset boat ride home, we were visited by a pod of more than 50 dolphins. Absolutely magical. This is an experience you can leave the tank behind for! 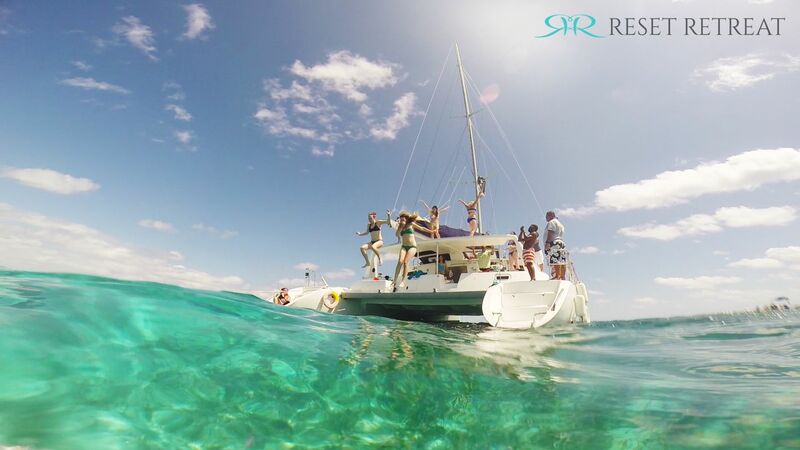 We sailed on the gorgeous Infinity catamaran from Ecologic Divers, and were given tours of these two protected sites. It was wonderful to have knowledgeable guides to teach us about the area, the life we were seeing, and that showed real respect for the marine reserve and all of its creatures. Not to mention getting to experience all of this on the nicest boat in San Pedro with the best crew you could ask for!! For an extra special adventure, check out the Night Dive at Hol Chan. The site is completely different at night, with flashes of bioluminescence and morays roaming in search of dinner. Watching the nocturnal movements at Hol Chan is a unique experience. Don’t miss it! I have a thing for sharks. 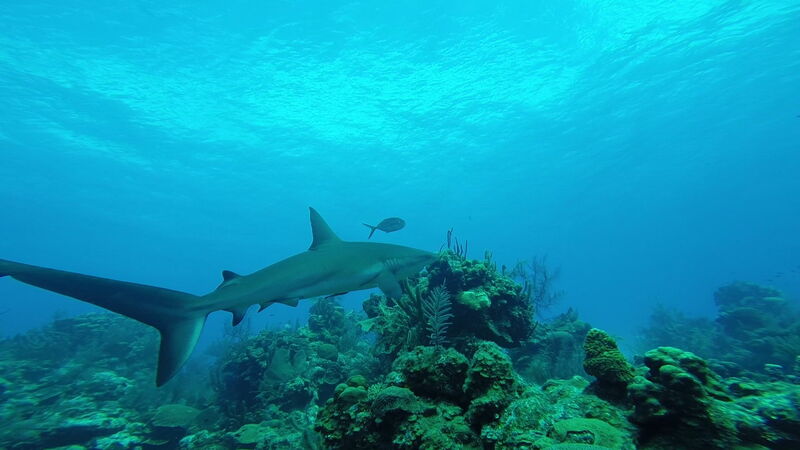 And in Belize, it’s almost impossible to go on a dive without seeing at least one shark. One of my favorite dives for shark sitings is Tackle Box. The nurse sharks that inhabit the area are so friendly! 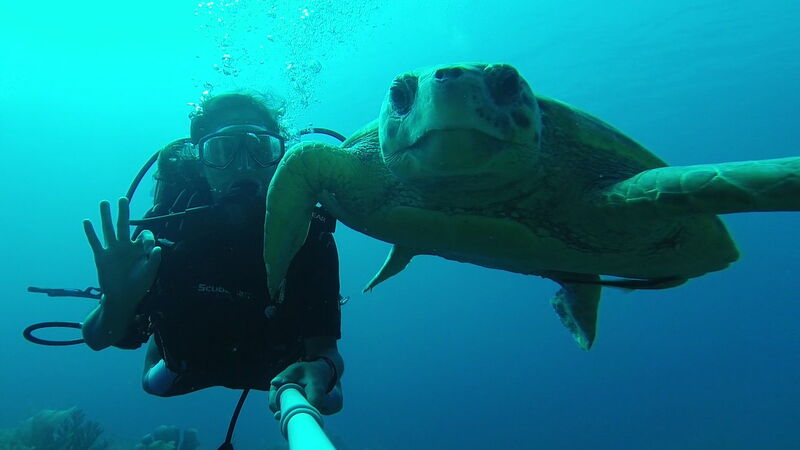 They swim right up to you, follow you around, and often take their place as your unexpected dive buddy. It’s common to encounter reef sharks in this spot, and a spot I could dive 100 times and still find exciting. Another day trip that would be a shame to miss out on! Mangrove covered Turneffe Atoll has an incredible variety of marine life that is difficult to find elsewhere. The wall dives Calabash Caye, Virgin Corals, and Turniffe Elbow are visited on the trip. Diving the Elbow was unbelievable. The drop-off is home to huge schools of jack, snapper, and grouper. Watching Spotted Eagle Rays fly by as you drift around the spectacular coral formations, it’s hard not to feel absolutely in awe by this beautiful underwater world. I can’t wait for my next visit to Belize this November. I can see why so many people who visit San Pedro end up calling it home. If you’d like any tips or recommendations for a visit to San Pedro or diving in Ambergris Caye, get in touch with me at Reset Retreat, or follow me on Instagram! 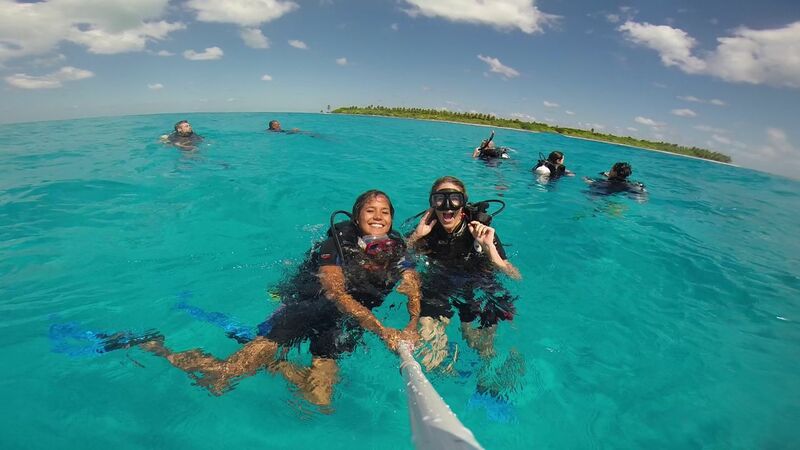 Have you been on your own Belize Ocean adventure? share your comments with me below! HI Charlie, the Great Blue Hole dive sounds incredible. We have done a lot of snorkeling in the Caribbean and Hawaii but never been diving or experienced anything like that. Sounds amazing and your pictures are out of this world, lol. Thanks for sharing. Shark Ray Alley is a great alternative for non-PADI certified divers (i.e. snorkelers). I really enjoyed snorkeling there and Hol Chan. A visit over to Caye Caulker is worthwhile, too. Plenty of affordable hotel and restaurant options here, and the sunset from the Split is incredible!